The Denver chapter of the Daughters of Penelope has been around for a long time and it shows that the communication and digital promotion has not changed to adapt to the times. The organization currently has no digital promotion. While the organization is composed of older women, it is also composed of younger women, who use technology in their day-to-day lives. The primary goal of the organization is to make it a known organization in the local community. On a national level, the Daughters is the largest international women’s organization and no one knows what it does or how to support its causes. The organization has not been promoted locally at all, which deters from making a name in the community, what they stand for and what kinds of causes they want to be involved with. The women of this organization want to help other women with common issues they may face, including domestic violence. Other issues, such as human trafficking, is becoming a focus of the organization, as it is a growing issue in cities like Denver. Other service projects include packing food kits to donate to hungry children, as well as raising funds to donate to projects such as Penelope House, a domestic violence shelter. There is an opportunity here to bring this chapter of the Daughters of Penelope digital promotion to promote the organization to its current member and potential member from the Orthodox community in Denver. The Daughters is looking to recruit more members, and a way to do this is to broadcast the message of their organization to other Orthodox churches in the Denver metro area and beyond, reaching across the entire state, seeing as many do not know what Daughters of Penelope is or what they do. The organization also wants to reach the state legislature and town councils. This way, they can work on enacting change in the area by making these entities aware of the organization and what they do. A digital promotion plan will benefit the chapter going forward, as the organization will be able to bridge the gap between traditional communication and digital communication. In order to be ready to implement this promotion plan, there will need to be a committee established to be specifically focused on promotions. The newly formed communications committee would be perfect to have to run not only the communication among the members, but the promotion to the different audiences as well. Additionally, it would be beneficial to get the word out about the new promotional tools to the members of the chapter as well as the other members of the AHEPA family – Sons of Pericles, Maids of Athena and AHEPA so then they too can promote the Daughters on their own promotion platforms. Obtain a URL appropriate for the chapter, that properly identifies the website as being Daughters of Penelope while also identifying the chapter. Once these steps have taken place, the Daughters will be ready to implement their digital promotion plan. The first and most important idea to promote about the organization is their values. Every aspect of the promotion should portray the organization as being focused on Hellenism, education, civic responsibility and philanthropy. These values should be conveyed to both members and nonmembers who are interested in the organization. The second idea to promote about the organization is their focus on women’s issues and rights in the Denver community. The organization should be conveyed as a positive resource in the community. Their focus on specific activities, such as domestic violence, should also be promoted, so other local organizations can see DOP as a group of women helping other women. They want to be conveyed as an organization that is civically active and philanthropically charged, always working on the causes/ideals that they believe in. Last, the organization wants to promote the idea of a sisterhood and comradery amongst their local members. By doing this, they hope to increase membership by promoting both this idea, and the idea of being an active and giving organization. It is crucial to reach first and foremost, the members of the organization. Secondly, it is important to reach the rest of the AHEPA family so the rest of the auxiliaries are familiar with the work of the organizations so they can also participate in the events. In terms of media consumption, the idea with this plan is to begin with basic promotional techniques that can later be expanded as promotion grows for the organization. It is also meant to be something that can easily be accessed and viewed by all walks of life on all different types of devices, ranging from computers to tablets to phones. With all of the promotional materials for this campaign, it is important to keep the mission and purposes of the organization in mind. They focus on civic responsibility, education, philanthropy and Hellenism, so that is what this campaign is going to promote. The goal is for people who look at the promotional materials to get a sense of these values, as they are important to the organization. The goal is also to focus on women’s issues, such as domestic violence, and other organizations the DOP are focusing on to come through in the promotional materials so the audiences of these materials can see exactly what causes the Daughters are working towards. The last message the organization wants to convey with the promotional materials is the idea that the Daughters is a sisterhood and they want to recruit more Orthodox members from the Denver area. The promotional materials will also be flaunting the organization, while promoting the values of the organization. Since the organization has a wide range of ages, it would be best to do promotional strategies that would appeal and be accessed by all ages. As much as utilizing social media would be great, many of the older members are not on social media, so there would be a whole audience that the organization would be missing. That being said, the development of a website would be more readily accessible. Additionally, an online newsletter would help the organization cut down on their postage and paper costs, seeing as most of the members use email. Lastly, a promotional slideshow would be the simplest way to showcase the organization’s work and can be easily produced. The website will contain information about the organization, FAQs, how to join, history, etc., so prospective members can access this information for the local Denver chapter. The site will also eventually provide an interactive calendar of upcoming events for both members and non-members to see. This calendar will be easily integrating into Google Calendar and iCal for the busy women on the go. One of the main purposes of the website will be to educate members about the mission and purpose of the organization, something that is not very well-known right now. The website will also be a resource to digitally integrate documents such as the monthly newsletter, list of members, etc., so all members can have access to this and refer to it. One of the major problems is providing updates to for the organization, so one of the functions of the website is to also provide updates for the organization in terms of events and partnering organizations. The website link can then be promoted through the AHEPA family on their various websites and social media. The site can also be linked on the AHEPA 145 chapter site and on the national Daughters site so it shows that Denver’s chapter does have a resource of information. The purpose of the newsletter is to keep members informed about upcoming events and decisions made by the executive board. We want to digitally deliver the newsletter because it will cut down on printing and postage costs for the organization. The newsletter will be delivered via email in an easy to read format. The text of the newsletter will eventually be in both Greek and English to cater to the needs of the first-generation members. The purpose of the promotional slideshow is to recruit new members into the organization. The slideshow will also address FAQs and give some history of the organization. It will be posted on the website for members and prospective members to share easily via email or social media to get the word out about the organization. The slideshow can be viewed as a PowerPoint in large settings, or as a PDF for a quick read of the information. Web Traffic – the amount of visitors to the website will be counted to measure the exposure of the organization. Slideshow shares – the views of the promotional shares will be counted on social media to determine whether or not the exposure of the messages of the organization was achieved. Member Feedback – member feedback will be taken into account as to whether or not the distribution of an online newsletter is an effective means of distribution for the organization. The website will have a static homepage providing a basic overview of Daughters of Penelope as a whole and what they do as an organization. The bottom of the homepage will have an attached PDF document of the promotional slideshow outlining information such as the history of the organization and how to get involved. The top menu will have tabs such as “Projects,” “AHEPA Family,” “Events,” and “Contact.” Under “Projects,” it outlines all of the national projects that Daughters is focusing on for the 2015-2016 school year. Under “AHEPA Family,” there are links to each branch of the local AHEPA family websites or social media: AHEPA 145, Maids of Athena Corinthia 160, and Sons of Pericles Rocky Mountain 83. Under “Events,” there are links to information about both the District 17 convention and the national Supreme Convention. Once the website grows, information can be included for local events the chapter puts on. Lastly, on the “Contact” page, there is a contact form that people can fill out to get information about the local chapter and getting involved. In the future, there can be a “Members” tab as well as a “News” tab. Under the “Members” tab, a list of the chapter’s members can be uploaded for those to view to see who is involved in the organization. Additionally, the “News” tab can include information such as press releases, national DOP news, and the chapter’s monthly newsletter. This website theme has a lot of options for widgets, such as embedding photo galleries on the right or left sidebar, a calendar through iCal of upcoming events and social media icons. Additionally, text boxes can be used to outline information such as the officers of the organization. The website also has capabilities to have a blog page where members can provide short updates of events or opportunities for the organization. Once the organization gains more of an online presence, more of these tools can be implemented on the website. There is a link to the national DOP Facebook page at the top right corner. Eventually, once the chapter establishes their own page, they can implement their own social links. There are also social links for Flickr, YouTube, LinkedIn and Twitter. Additionally, a .org domain name can be purchased for the organization to be used instead of a .wordpress.com domain. The website is a responsive theme so it can be viewed on desktop, tablets and mobile. This caters to the variety of technology knowledge members might have. The website has easy, clearly labeled navigation for ease of searching. This newsletter was made in Adobe InDesign, but something similar can be created in Microsoft Word or Microsoft Publisher. The newsletter features highlights from the month, such as various events and service projects. Additionally, it will provide updates that members may have missed from the last meeting, such as the update from the newly formed communications committee. A few bullets in the newsletter highlight what was talked about at the meeting. 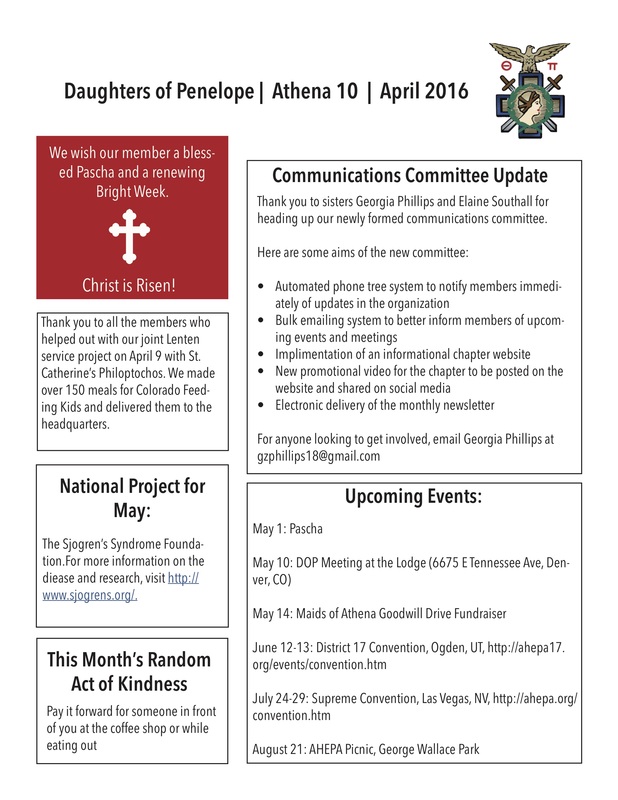 The newsletter will also feature events from the Daughters, such as meetings and other branches of the AHEPA family such as AHEPA and Maids of Athena. This will make the members aware of what other branches are doing and could help them becoming involved. Lastly, the events will include district and national events in order to keep members informed. A few other things included in the newsletter would be national DOP correspondence, such as the monthly service project based on the national projects chosen for the year. Another thing would be the random act of kindness for the month, an initiative for the chapter by president Elaine Karubus. This newsletter would be a PDF and then emailed to a list of members curated by the secretary, who is currently in charge of correspondence with members. The newsletter will then be posted on the website for members to also access. This would be beneficial for all the women on the go who access their email on a regular basis. It is very easy to read and skim, which is something that works for an e-newsletter. It is a condensed version of the information, highlighting key facts. The promotional slideshow’s purpose is to give information about the organization to recruit members. The slideshow outlines the history of the organization, how it fits into the AHEPA family, and the activities of the organization. The slideshow can eventually be expanded to include photos of the chapter, District Lodge and the Grand Lodge as they are received by the organization. It can also further include information about the Athena 10 chapter, its members, and its initiatives. With it being a PowerPoint presentation, it can be easily edited by members and does not require any additional knowledge of specialized software, which is beneficial to the members of the organization. Additionally, the slideshow can be modified to include social media links once the organization establishes a social media presence to entice potential recruits to look at their work and follow them. This can help to build a relationship and get the word out about the organization. The unique aspect about this slideshow is that it can be seen in its full form on PowerPoint, to where it makes it look almost like a video, or in a PDF document for easy access on the website. That being said, this is uploaded on the home page of the website for easy access, while the full presentation can be viewed in a group setting.